Want to get your hands on gelato? Then you have to know how to order it. It seems like ordering a takeaway drink or snack in Italy should be pretty simple. After all, how different can it really be from grabbing a “skinny latte, venti, no whip” back home? Believe us: It’s different. And, in the worst-case scenario, confusion can lead to irking the server, prolonging the line, or even (uh-oh!) winding up with the wrong food. But don’t worry. We’ve got you covered. Here’s how to order three of Italy’s greatest offerings—gelato, coffee, and pizza—like a local. For the moment, we’re going to sidestep the whole debate about what makes Italian gelato different from American ice cream and simply address the big question: Whatever this delicious stuff is made out of, how do you get your hands on it? Every gelateria is a little different. Still, here are the basic steps you should follow in most. 1. Decide which flavors you want. Flavors? Yes, flavors. At most gelato shops, even a small cup or cone gets you two or three different flavors, so you’re not limited to just one. Hooray for choice! If you just can’t decide between a couple, don’t worry: You’ll get a chance to taste, if you must. 2. Pay before you go up to the gelato counter. On entering the shop, you’ll be able to spot the cash register, or cassa, pretty quickly. That’s where you pay for your gelato (usually, all you’ll have to know at this stage is what size you want). Make sure you don’t then drop your receipt on the ground in absent-minded excitement over your upcoming gelato. Hold onto it. Like in the U.S., you’ll be asked if you want a cup or a cone. Unlike in the U.S., obviously, you’ll probably be asked this in Italian! We tend to like cups, ourselves. Cones require a high degree of coordination to eat from while simultaneously gawking at, say, the Pantheon. Cups are much neater and easier to handle. Plus, gelato purists would say that cones undermine the flavor of the gelato—the reason why some artisan gelato shops don’t even offer them. 4. Get the server’s attention. If there’s a crowd of people, holding your receipt up into the air is a useful way to do it (and to let him know that you know what you’re doing and will make the process fast and painless for him!). If the place is crowded, though, remember to be patient. Everyone will get served. 5. Make any last-minute flavor decisions. If you still haven’t decided on your final flavors, it’s okay to ask for a taste. Just try to avoid doing this if the place is crammed. (Children, though, can probably get away with it anywhere). Once you have the server’s attention, hand over your receipt so he knows you paid. Remember to let him know if you want a coppa or cono, along with the flavors. If the place is packed, then try to be fast: If you don’t know the Italian flavors, just pointing will do! And for the love of gelato, please don’t let your three-year-old pick her flavors right there on the spot, rather than figuring it out ahead of time. (Unless you’re the only one in the gelateria). And remember your “nice words”—even if you don’t speak any Italian, using “grazie” and “per favore” will make everyone happier. 7. Eat how you like. Unlike other Italian foods, gelato is something that doesn’t have to be eaten sitting down. And generally, gelato shops won’t have a place to sit inside, anyway. Our favorite: stroll around while eating your gelato, or find a sunny spot outside to enjoy it. Need a morning or mid-afternoon pick-me-up? 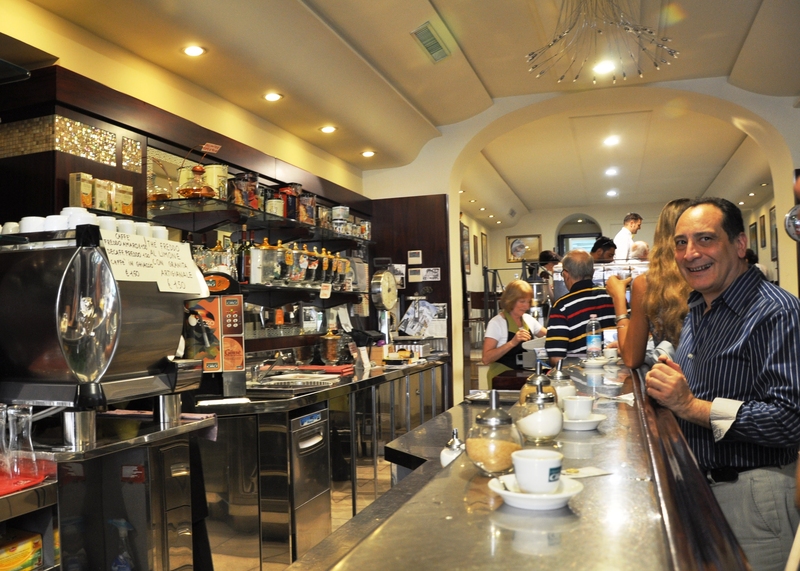 Cut the costs of that coffee by more than half, and do it the Italian way, by following our guidelines. Remember: saying simply “coffee,” or caffè, will get you an espresso, not an American drip coffee. If you want it American-style, say caffè americano (but be prepared for it to be a shot of espresso in hot water, not filter coffee). A cappuccino is coffee loaded with foamy milk; a caffè macchiato, coffee with just a “mark” of milk; a caffè latte, mostly milk with just a bit of coffee. Like in the gelateria, you’ll see a cash register where you pay. Do this before ordering. An espresso should be about 80 cents, although the price varies depending on where you are. 3. Go to the counter and get the server’s attention. 4. Drink your coffee standing there. Don’t take it and wander off to a table, even if one is available. As soon as you sit down, you’re supposed to get—and you start paying for—table service. That’s when the price of that coffee suddenly doubles or triples when you sit down. And that’s why you often see far more tourists than Italians doing this. 5. Leave behind a small tip. Before you leave, put down a small coin; 20 cents will do. It’s not necessary, but it’s a nice token of gratitude for the server. Say “Grazie!” and “ArrivederLa!” or “Arrivederci!” as you leave—it’s considered rude to depart without saying anything. One of Italy’s best-kept secrets is its takeaway pizza. You don’t have to sit down to dinner to enjoy Italian pizza; you can wander into a number of shops and get it to go, an especially good option at lunchtime, when most authentic pizzerias are closed anyway! Here’s how to do it. (Sensing a theme here?) 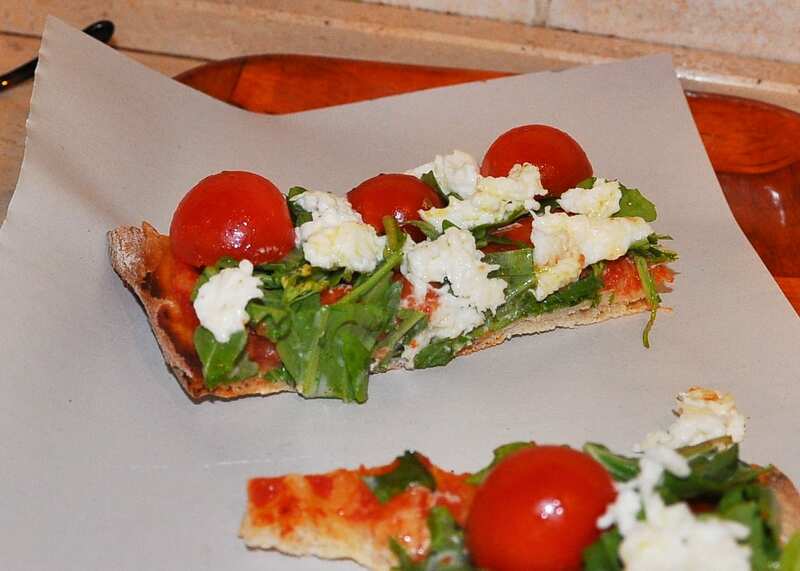 Be aware that while there might be a pizza menu hanging up with lots of options, unless something is coming out of the oven in the next couple of minutes, you’ll probably be limited to whatever you see already in the display case. 2. Order the pizza, including the size, from the server at the counter. In other words, he won’t just ask you what kind of pizza you want—he’ll also ask you how much you want. That’s because you pay by the weight, rather than by a standard-sized slice. Generally, he’ll help you out by putting his knife where he thinks you might want him to cut it; tell him smaller (“più piccolo”) or bigger (“più grande”), and don’t forget the “per favore”! He’ll either give you the receipt and have you go to a separate register to pay or, if it’s a smaller place, take your money right there. 4. Eat at the counter. If there are stools, you can sit. Or you can take your pizza outside. Generally, though, it’s more polite and neater to eat right in the pizzeria, rather than on the street. 5. Make sure you say goodbye. Again, a “Grazie!” and “ArrivederLa!” or “Arrivederci!” go a long way. Just a comment about about the cone/cup conundrum. Ask for a cone. That whole thing about no cone being good enough for the gelato is simple arrogance. If you don’t like the cone you can throw it away and it will decompose. But you ALWAYS end up throwing away the paper cup and the PLASTIC spoon! Rome has enough trash already. Don’t add to the problem. Good point Katherine! Although, sometimes my guilt over creating more trash often gets overpowered by my guilt for consuming more sugar unnecessarily… is that bad? 😉 I guess it’s pointless to watch your caloric consumption while eating gelato in the first place… hah. So the message should be, if you get a cup and spoon, use the bins! Or go to GROM where they use all recyclable products and provide nice, pre-sorted, recycling bins. I love the cone! I suppose being on vacation made it okay to eat a few more calories! It took nothing away from the gelato, as you eat the cone last/ towards the end! Less trash fir sure as the trash containers were always full!! I had no idea that coffee and pizza go well together in Italy! It has always been a dream of mine to travel to Italy and have some pizza. Just as you took the time to write down right here, make sure to try all of the different flavors that they have to offer. Thanks again and I will be adventurous!